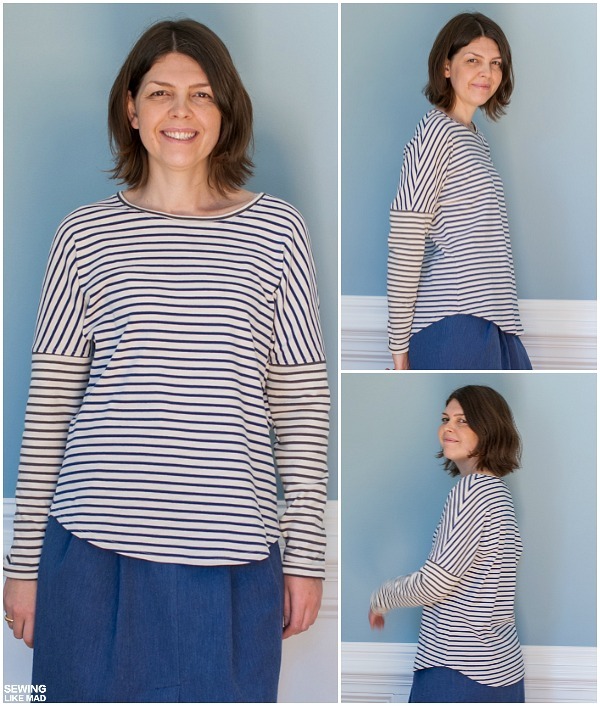 Sewing Like Mad: The Aurora Tee (Hey June Patterns) + Burda Style Narrow Pleated Skirt. 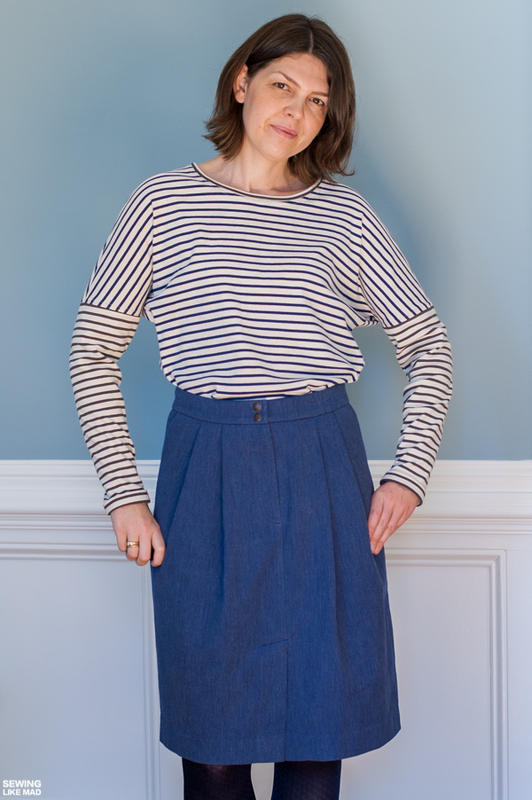 The Aurora Tee (Hey June Patterns) + Burda Style Narrow Pleated Skirt. 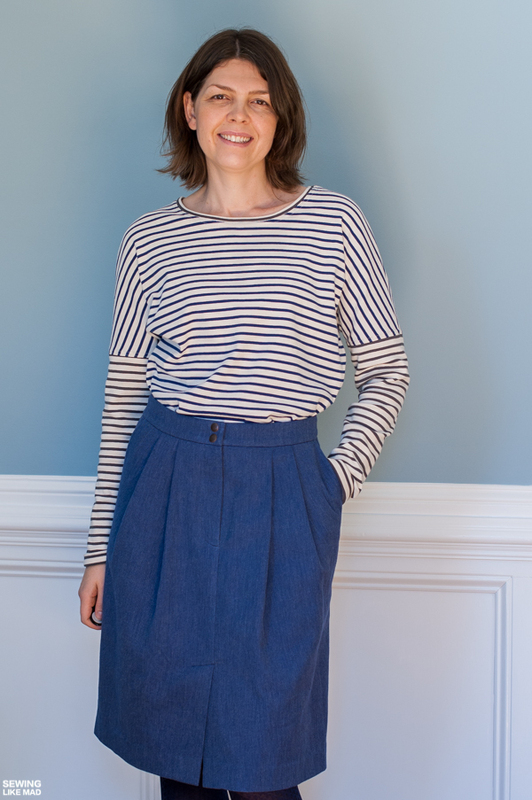 The stripy item is The Aurora Tee by Hey June Patterns and the skirt is the Narrow Pleated Skirt 10/2015 #107 from Burda Style. It is my first time sewing both patterns. Let's talk Aurora Tee first first. 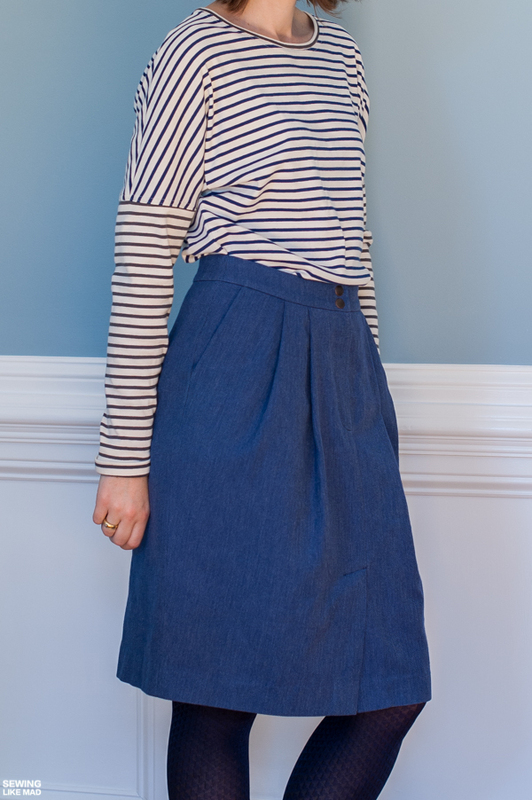 Gah, I'm turning into such an Adrianna (designer of Hey June Patterns) fan girl. 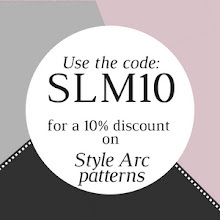 Her patterns are well drafted, the tutorials are thorough and helpful and the styles are perfect for every day use. What more can you wish for? Oh, what about a designer that care deeply about her customers. Drop by her FB pattern group and you will see for yourself what I mean. 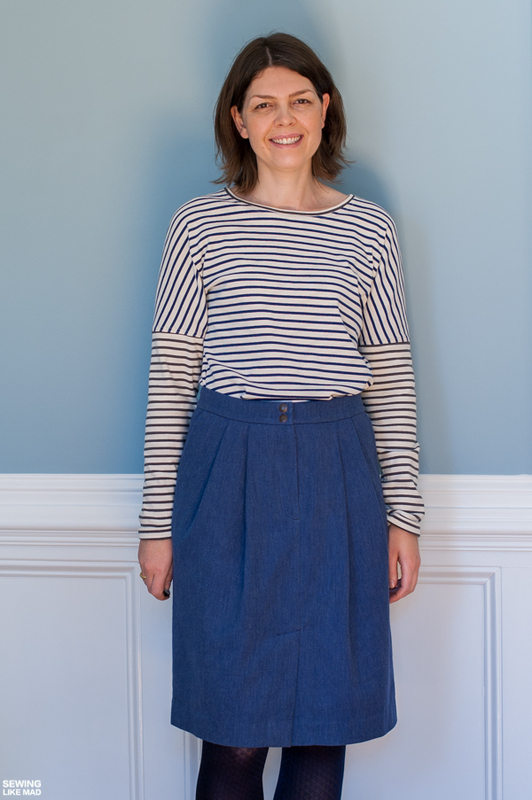 I never intended to wear the tee over the skirt like I am doing in the photos above but on the other hand it felt a bit unfair to post about a tee pattern without showing it fully so I snapped a few photos of that too. I love that curved hem. I'm pretty sure it's not meant to be quite as slouchy as I made it but I'm also pretty sure that I will be forgiven, ha. My measurements put me in a size small but I decided to make a size medium. I have a bit of a 'slouchy' flip right now (paired with something fitting like the skirt or tight jeans of course) and it turned out exactly like I hoped. The dolman sleeve gave the opportunity for some color blocking 'light'. Okay, who am I kidding....of course I didn't have enough fabric bahaha. The fact that I used a knit rib (firm but still with a significant amount of stretch) of course also added to the slouchy look. The pattern is drafted with a neck facing but since I was actually sewing with a knit rib fabric, it was kind of obvious to make a knit rib neck opening instead. That also helped me with the a-little-bit-too-big neckline that my project-slouchy-look gave me, ha. I also ended adding a knit rib cuff to the sleeves. I have long arms and never expect a pattern to fit my arms' length. Sometimes I add length while cutting the fabric and other times I just see what happens after first fitting because I know I can always add the cuff. What I didn't expect to happen was that the sleeve is now too long, gah. Totally my mistake! So I fold the cuff in half when I'm wearing it and now it finally fits. Gah Mie, get it together, ha. Hello, it's just me standing here sticking out my leg. Jeez, blogging can be awkward. Let's move on the skirt. Like I said it is a Burda Style pattern. 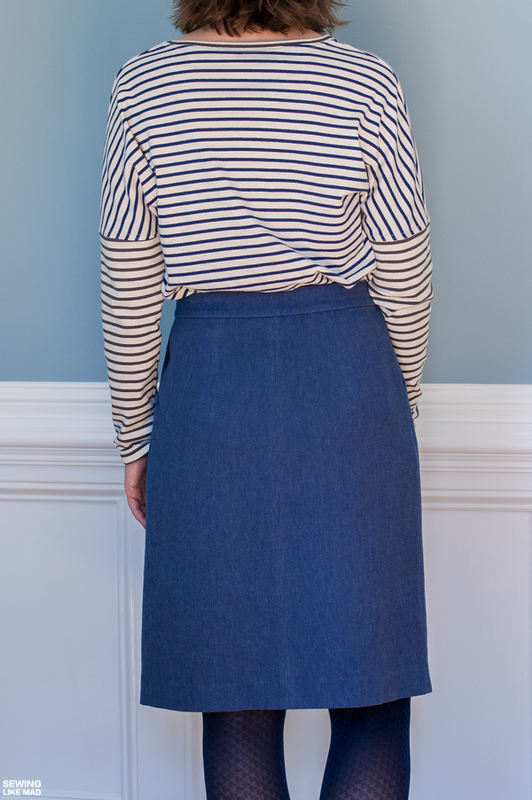 Narrow Pleated Skirt 10/2015 #107. It has a zip fly, front slit, side pockets and front pleats. Basically all the fun happens at the front on this skirt, ha. It does have a faux pocket flap at the back but I skipped it for unknown reasons. Maybe I kind of forgot, ahem. Back darts and a center back seam helps with a great fit. The fabric is fascinating. On photos is looks like denim. In real life it looks like a thin wool but really is it a soft cotton. Fabric from Theory bought at Mood Fabrics. I made a muslin before cutting in the real fabric and I cannot recommend that enough. I moved my pleats a bit closer towards the center front. They originally added a bit too much bell shape to the skirt and is there something I do not need on my lower pear shaped body, it is that! Another reason for the muslin recommendation is this. I think it might be quite small at the waist or way more high-waisted than I was looking for. 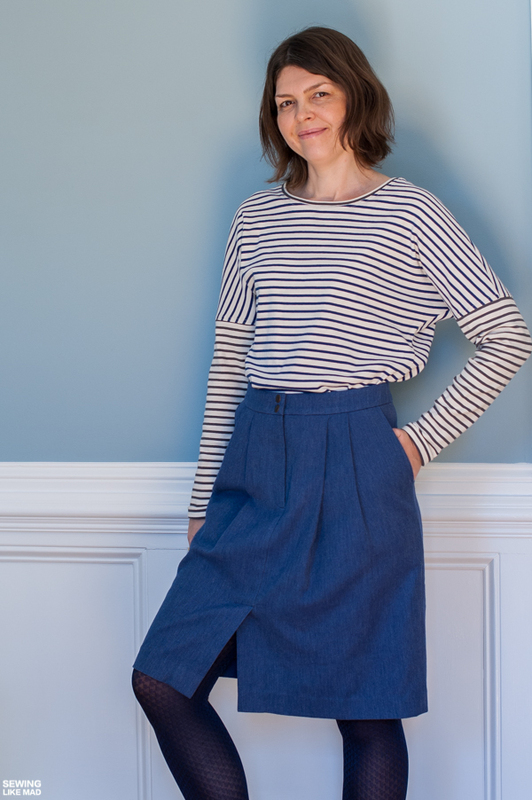 The waistband pattern is a rectangle and that is usually not a great idea for me (again, pear shaped) so I need a fitted waistband that is smaller at the top than the bottom. I made the mistake of making changes to the pattern before even sewing up the muslin. I slashed and gathered the top of the waistband pattern, turned it into a fitted waistband. I really didn't think that would be a problem. I made a size 40 to accommodate my hip measurement and with a waist measurement being (73 cm / 28.7") that should still have been too big for the size 40, but instead it was too small. And not only too small at the top of the waistband (which was the only place I made changes), also the bottom of the waistband and very top of the skirt. Oh well, it all had a happy ending because I was still at the muslin stage and I'm SO crazy happy with the fit now. 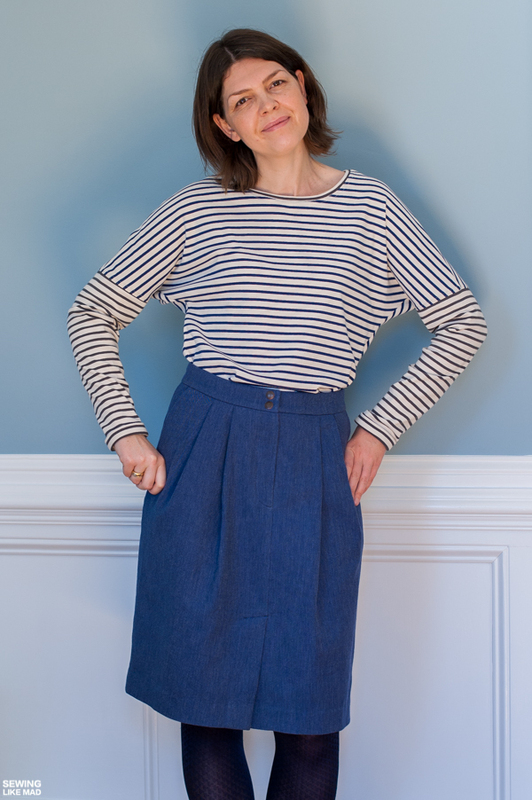 HERE is a link to a tutorial on how to make a fitted waistband from a rectangle. 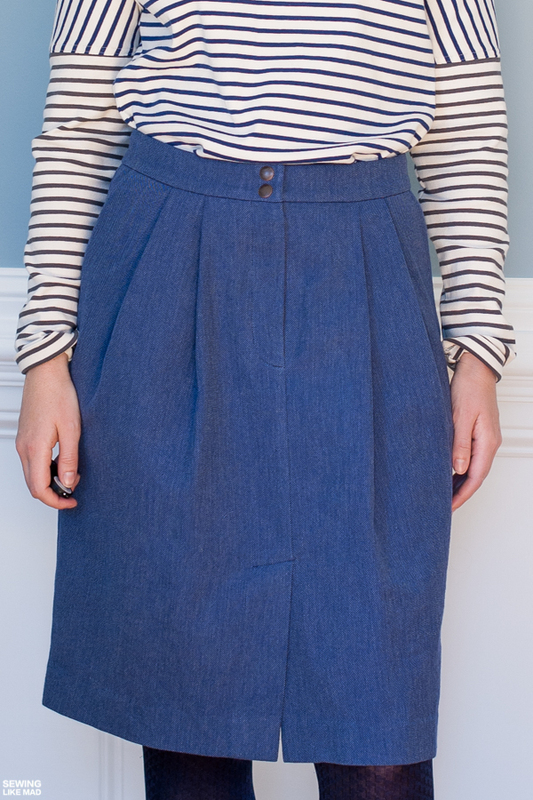 Skirts with pockets - especially slanted front side pockets - forever love affair! I hand sewed my hem. Ugh, I'm really not very good at that. You can totally see the stitches. Oh well. I really didn't make things easy with this skirt. Halfway through the sewing process I decided to add a lining since I was worried my fabric was slightly see-through. Gah, the pattern does not even include a lining so I had to draft it myself. I'm not blaming the pattern for not coming with a lining (although when you recommend/suggest using wool fabric then I would say a lining is in order) but like I said, it certainly didn't help me with a smooth process, ha. I had already sewed my zip fly which meant I had to hand sew the lining to the fly facings - something that otherwise wouldn't had been necessary if you know from the start. There might have been a few bumps on the way with the skirt but I'm really really happy with the end result of both these patterns and this outfit is SO my style - relaxed yet stylish. Get your Aurora Tee HERE. 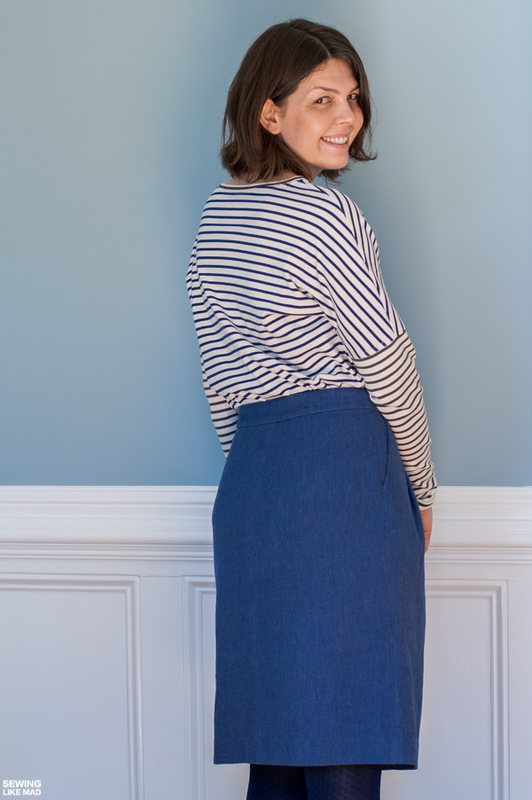 Get your Narrow Pleated Skirt HERE. Nothing wrong with being and Adrianna fan girl...so many of us are! And I find that her patterns are (almost) long enough for me in the sleeves. I have gorilla arms, but have to add less to her sleeves than other pattern designers. Totally agree....it was almost long enough which is probably why it became too long when I added the cuff haha. Aw I'm blushing! That's high praise coming from an expert like you! And yes, I draft all my sleeves so they fit ME because I'm selfish and usually people have to take off like 3". Long arms unite! 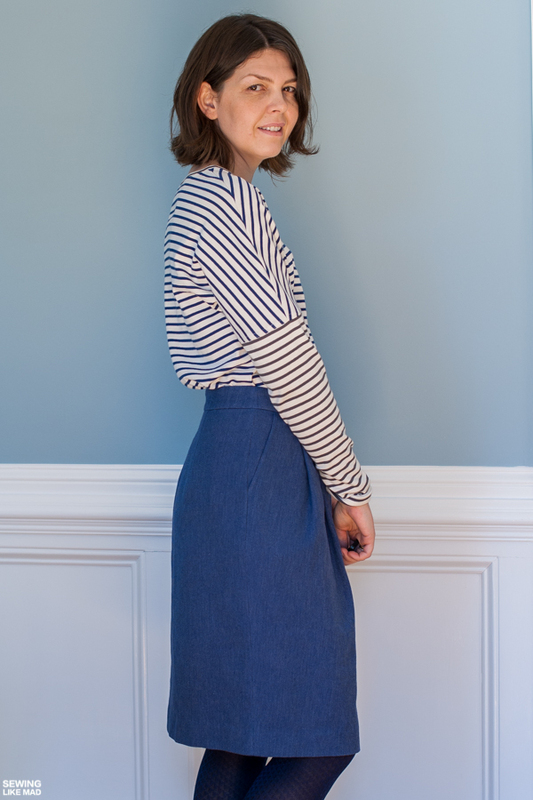 More stripes please! Love this one! I love this outfit!!!! I need these patterns, right now!! Great post, so informative, thank you. I happen to love the slouchy!!! Looks great on you, as always - so well done! Seriously, I am running out of superlatives for you. 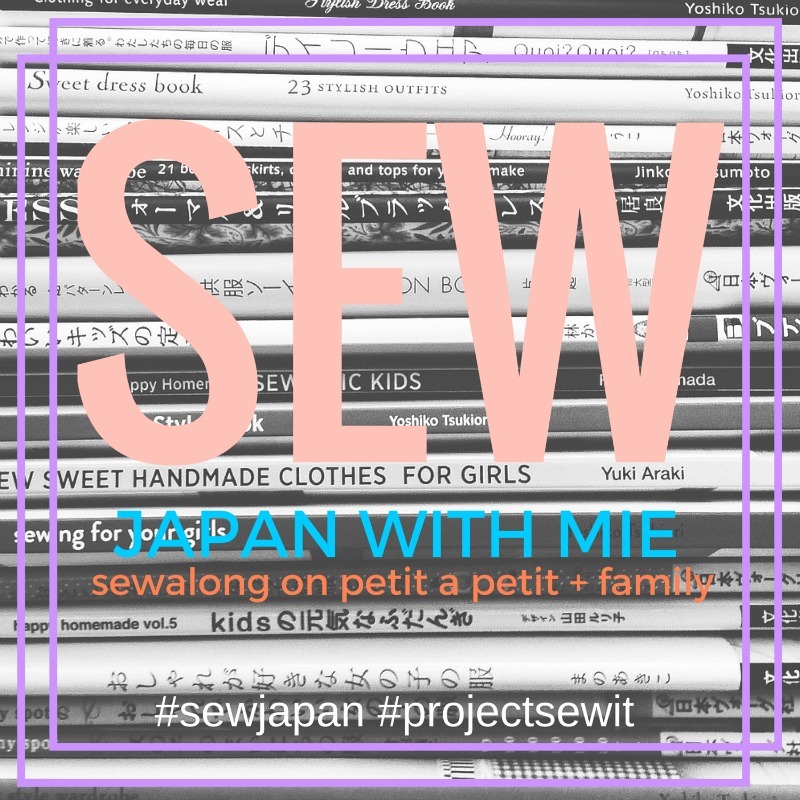 Every time I see something you've made, I want to declare it the best thing ever -- and then you go and sew something else that is just as fabulous. 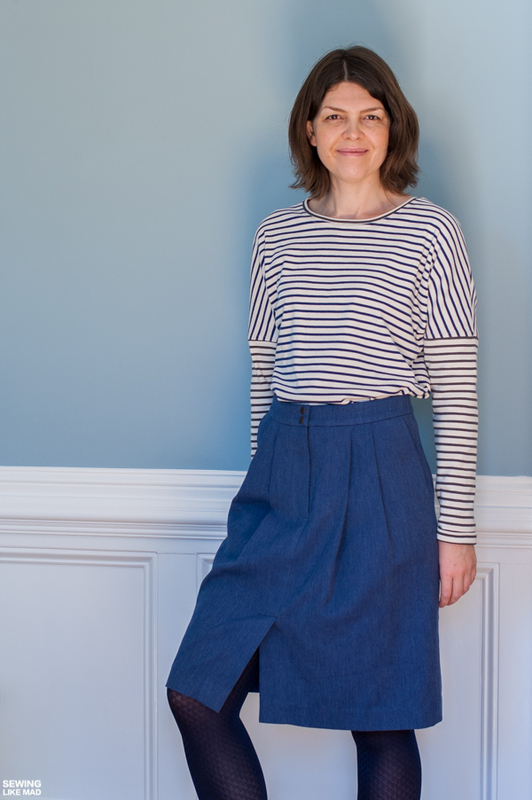 I love the stripes on parade on your blog! Keep them coming (because I am too afraid to sew with them, haha, so I'd rather an expert tackled them). Love that skirt, too! Sooooo pretty with the pleats! I didn't notice the difference in colour on the shirt at all until you mentioned it! Love both the tee and the skirt, and definitely thumb up to them paired up this way. Slouchy plus fitted all the way! 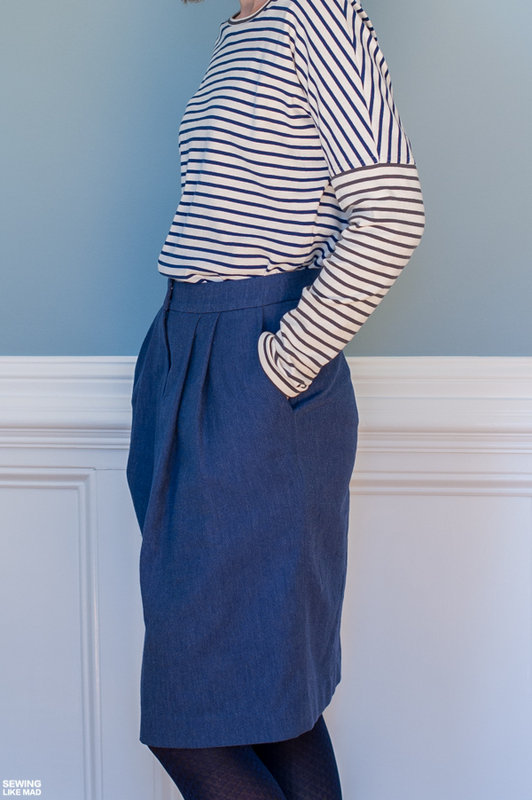 What a fun shape to the tee, and the skirt is adorable. This is such a great outfit! That tee is awesome and you know I like slouchy. And the skirt is absolute perfection on you. That fabric looks amazing, I can't believe it's cotton. The photos are gorgeous- I love everything about this post! I love it. You look laid back and vintage at the same time. That rib from organic cotton plus is really nice. I just finally ran out of it after using some for several kid projects. So lovely! I am really digging this relaxed style too. Great styling, and of course, impeccable sewing! Well done my friend! This looks great on you, Mie! Even though the skirt turned out to be too high waisted for your preference, I think it looks fantastic on you! And that top is amazing! Ohh I'm sorry - I got to the end of the post just as Hazel was waking up from her nap, so I had to rush through that last bit. Well, in that case, I am glad you made the muslin because it looks fantastic on you!!! A job well done and certainly worth the extra effort! This entire outfit looks like it was bought at the GAP! Now I want to make an Aurora Tee! Great job.